Hello campers! At long last the design for the cover of The Colonel and the Vicar has been finalized, and I’m happy to provide a “sneak peek” for all my followers on Facebook, Twitter, and LinkedIn. 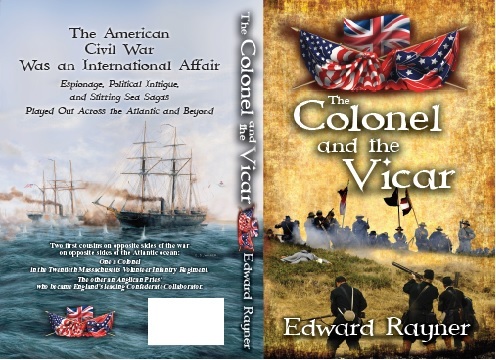 The front cover, back cover, and spine is emblazoned with three flags that symbolize the story’s politics: the United States and Confederate States crossed together with the British Union Jack between them. If you’ve been following along, then you know that during the Civil War the U.K. built ships for the Confederacy, hence the Union Jack in the middle. The front cover image is actually from a stock photo (i.e., inexpensive) that is supposed to depict Henry’s first battle experience with the 20th Massachusetts Infantry Regiment at the Battle of Ball’s Bluff in October, 1861, near Leesburg, Virginia. 1700 Union troops squared off against about the same number of Confederates and the Rebs scored a decisive victory largely due to a problem that plagued the Union army especially in the first two years of the war: poor generalship. Over 500 Yankee troops were taken prisoner, including the Twentieth’s regimental commander, Colonel William Raymond Lee. Henry was not only fortunate to have survived but also lead some eighty men upriver where he paid $5 to a slave for a small boat that was used to ferry the men across the Potomac River to the safety of their camp in Maryland. The back cover image is an actual painting of the “Duel Between the Kearsarge and the Alabama”. I was lucky to find the artist, Edward D. Walker, who makes his home in Liverpool. 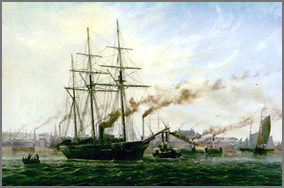 We struck up a conversation over the painting, as I’d noticed that the painting correctly replicated the result of the Kearsarge’s opening volley, which struck Alabama’s spanker-boom sending her naval battle ensign away into the wind. When I mentioned this to Ted, he explained in an email, “There are many reputable historians behind every painting I work on, in fact I would be lost without them. In 1987 a group of historians and enthusiasts in the Liverpool & Cheshire area set up a charity to build a replica of the “Enrica” with the help of Cammell Laird’s who retained the plans and the builders model. I was appointed the official artist for the project and relied on guidance from the historians to paint the “Alabama” story. I was told of a quote made during the battle that a volley of shots blew the Confederate emblem away and a cheer rang out from the opponents”. I knew the exact quote because I had used it in the book: Kearsarge returned fire for the first time, and the first salvo “shot away Alabama’s spanker-gaff, and the Confederate Naval Ensign came down by the run. This was immediately replaced by another at the mizzen-mast-head” (from Memoirs of Service Afloat During the War Between the States, by Raphael Semmes, captain of the Alabama). Up until finding Ted I was having a devil of a time finding an appropriate painting involving the Alabama without running into copyright issues. There were many paths that lead to dead ends, and I started to feel like I was never going to realize the design I wanted until persistence research finally paid off. It cost 200 English pounds but it was worth it. As a final bit of historical irony, Ted’s wife Susan and her parents lived for a time in a house situated in Cambridge Road, Waterloo, about ten miles outside Liverpool. The house is still standing, and the occupier of the house during the Civil War was one James Bulloch, the Confederate agent who arranged for construction of the Alabama. Bulloch is just one of many interesting characters that is prominently featured in The Colonel and the Vicar as a close friend and collaborator with Father Frank. This means that I’m within striking distance of publication. The book’s materials are all in CreateSpace’s hands (the primary network publishing platform that I use). Hopefully it’ll all be clean or require only minimal modifications. That’s it for now. Feel free to browse my earlier posts and comment if you like. My book, “The Colonel and the Vicar”, has gotten past the significant obstacles of last month and is heading into the home stretch. 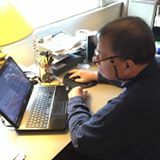 Copyrights resolved, beta-readers are done, interior book file has been accepted by the book mill. Full cover should be ready in a week. Made new connections “across the pond”. The only thing that I need to wait for is the copyright for the book from the federal government, and I’m not sure how long that’ll take because I didn’t copyright my first book. Thing is, one has to wait until the book is in final form because an electronic copy is required as part of the submission process, so one can’t arrange to get the copyright ahead of time. Still, I must admit to a bit of excitement over a project that took more than two years in the making. I sometimes wondered if I’d ever finish. 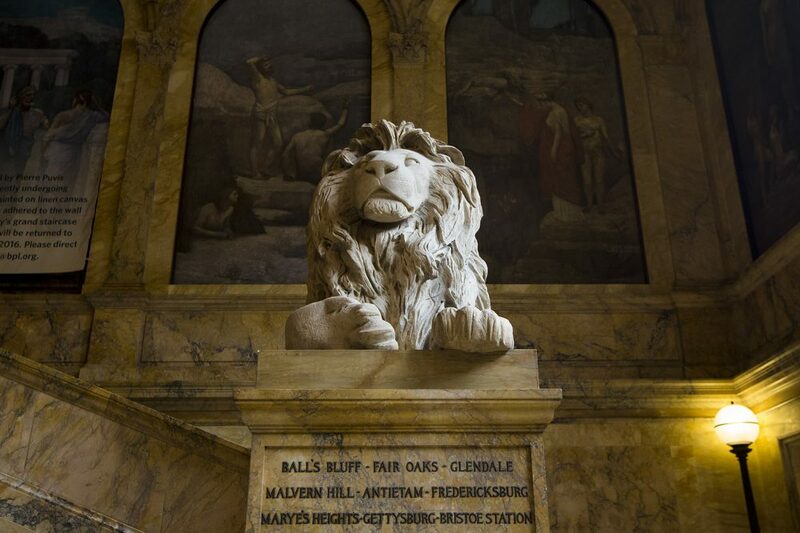 The book defies any single literary pigeonhole… the story uniquely combines historically accurate events, prose, and my personal ancestry in the persons of the main characters, Henry and Francis. Because the historical events are intertwined with their history, the story underscores the genesis and importance of those events, as well as the part that both men played on that stage of history. The scope of the Civil War is huge. Therefore in the case of Henry, the story includes descriptions of only the battles that he participated in. For Francis, though he was a non-combatant, the story includes his involvement in the espionage vis-à-vis Confederate naval operations which were greatly influenced by his collaboration with the South. Hello, followers! The image above is entitled “Duel Between CSS Alabama and the USS Kearsarge”, and represents one of several riveting land and sea battles in my book, The Colonel and the Vicar. British-built in 1862 under contract with the Confederate States of America, the Alabama was state of the art during a time when naval ship design was undergoing rapid change – the transition from sail to steam; the transition from wooden-hulled ships to ironclads; and ever-improving naval artillery. She was known as a “screw sloop”, so-named for the ship’s configuration of sail plus the addition of a steam-powered propeller for increased speed. When it wasn’t necessary, the propeller could be raised into a recess in the hull that streamlined the keel, thus eliminating drag, and conserving precious coal. 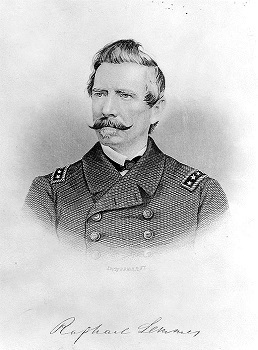 The Alabama’s captain was the audacious Raphael Semmes, who after a thirty-five year career in the US Navy, resigned his commission and offered his services to the Confederacy. 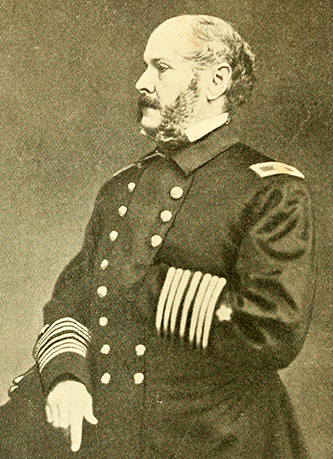 The USS Kearsarge was also a screw-sloop commanded by James A. Winslow, an experienced captain with thirty-seven years’ experience in the U.S. Navy. Together with other Union ships, the Kearsarge had been dogging the Alabama all over the world’s oceans, but the Alabama proved to be elusive and always seemed to escape danger. That was until June 19, 1864 when the two ships met in battle off the coast of Cherbourg, France. 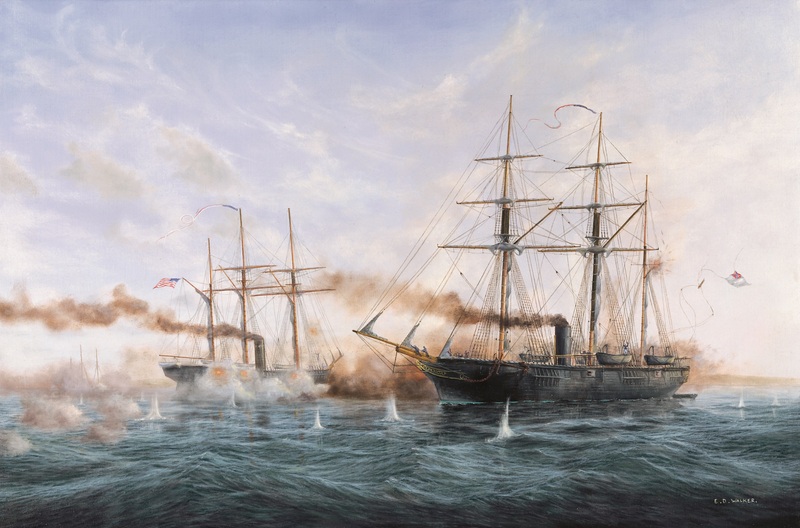 The “Duel Between CSS Alabama and the USS Kearsarge” was created by noted British marine artist Edward D. Walker.